Last Thursday one of my iPad app’s provisioning file has expired. Client brought it to us at the very late moment, the iPad app was distributed internally as an enterprise app. App users are for HVAC technicians, app integrates with their organization’s CRM (Salesforce) so distributing it with App store doesn’t make any sense. As immediate action, I tried to renew the provisioning files with iOS developer portal. It does not provide an option for renewing distribution profiles but developer provisioning was given an option to renew. The same goes for trying to renew with xcode organizer. As per “Ain’t broke don’t fix it” golden rule, I didn’t take any action. I thought, Renew button on distribution provision wouldappear once it get expire. The worst case scenario I expected was distributing a new build. It was hard to come to this conclusion at the time, deleting the provisioning file of a suspended app and removing it from background seems to work. I had to restart the device to confirm. Also later it was showing “Expires in 0 hour” and “Expired 0 hour ago”. There was no minutes so I had to wait like till the very last minute for testing. I gave up on the idea of providing new build with same AppID and tried a new AppID. No sugar there, stupid xcode and keychain util. Yes I tried the View->show expired certificates too. Finally I had to find the directory where xcode save the profile and delete manually. Also I have to search for ”” and “” in all Keychains and Category and delete them. Also created a new distribution profile with same app id. Every new version of Xcode delete the old or previous iOS SDK as its post installation step. I can understand this from Xcode developer perspective but from an app developer it is a nightmare. My system admin deleted all my previous xcode dmg archive from their NAS drive as it took 40+Gb. I had Xcode 4.5.2 installed on my dev machine and the application was built with iOS SDK 5.1. The Zip archive of xcode.app prior to xcode update didn’t help either. Not having an upgradeable device hurts a lot, I blame on both my company for not providing me a decent device and Apple for their limitations. 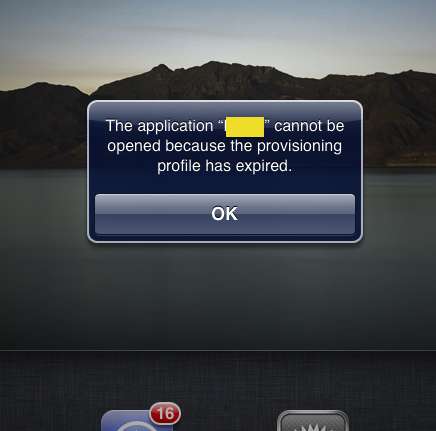 Application will not work once provisioning profile expired. Provisioning expiry time is UTC i.e., No timezone advantage even if you are NZ dev supporting PST customer. No way you could get a correct answer for Keychain Access and Provisioning file issues. Closed systems and DRM, even after paying large sum for devices and development you can’t install app without mothership’s cryptic certificates. XCode upgrades and Deployment targets are not your friends. iOS 6 Autorotation behaviour is your enemy when you build ios 5.1 target. Looong story short, I ended up creating a new distribution provisioning file with existing app id. So the technicians need not enter their user id, password and security token again. Also had to fix the the orientation behaviour for iOS 6. What I initially thought of a 10 min work took like 4 hours overall, timing was so perfect I left office around midnight. And I was morally down with my inability to make a right time estimation even after years of experience.